In ancient Egypt, the god of the underworld was Osiris, and he was depicted as laid out horizontally like a corpse in many scenes, slain by his brother Set and bound in a sarcophagus, cast into the waters -- all of which are emblematic of our plunge into incarnate matter in these human bodies. The Djed column itself (discussed in this previous post) was associated with the "backbone of Osiris," and it was figuratively "cast down" horizontally when Osiris was "laid out" in a sarcophagus like a corpse in the underworld (by the action of the sun's "crossing down" at the fall equinox). But Osiris was not destined to remain horizontal forever -- as the image above plainly intimates. He is destined to rise-up vertically, just as the shoots of grain shown rising from his body in the image above are doing. The raising of the mummified Osiris from the horizontal position to the vertical position was associated with the act of "raising the Djed column" from its "cast-down" horizontal position to its vertical orientation. I believe that the raising of the Djed column is figured by the vertical line between the two solstices, shown in the zodiac-wheel diagram below. The raising of the Djed, the raising of the "corpse of Osiris," could be seen to take place when the sun stopped its descending path and turned back upwards: at that point of the very "bottom of the year." In the system of celestial allegory we have been exploring together, we have seen that the myths and sacred traditions of the world almost universally depict the "upper half" of the year -- that part rising up from the spring equinox all the way to the summer solstice before descending again all the way to the autumn equinox, during which days are longer than nights (and yes, it is true that days remain longer than nights just a bit prior to and after the spring and fall equinoxes, due to the properties of physics and the size of the solar disc) -- as a heavenly mountain (including Olympus, Sinai, Mount Meru, and many more), as a shining city, or as Paradise. In contrast, the lower half of the year is depicted as a pit, an underworld, a place of toil and imprisonment, and as Hell (or Sheol, Tartaros, Niflheim, or Amenta). Esoterically, these beautiful allegorizations of the annual circle with its four most important yearly points of the two solstices and two equinoxes were used by the ancient sages who gave us the scriptures and sacred traditions of the world to represent their view of the human condition: plunging into incarnation at the autumn equinox, to toil through the underworld of this life until reaching the point of spring equinox and release from the present incarnation, there to rise up and soar into the heavenly realms of spirit until impelled again to descend into the material world. Alvin Boyd Kuhn, who is perhaps the most thorough expositor of this interpretation of the esoteric meaning in the world's ancient myth-systems, explains in Lost Light (published in 1940) that the horizontal line between the two equinoxes was seen by the ancient sages as representative of the soul of the man or woman "cast down" into incarnation, as if the spirit had "fallen upon its face" or was going about horizontally like an animal (because the spirit was now incarnated in an "animal" body), but that the vertical line which ascends from the winter solstice up to the pinnacle of the summer solstice represents the spirit ascending again, overcoming its "death" in the body, reclaiming its divine nature even though for a time it was imprisoned in the flesh of the material world. This most ancient, perhaps, of all religious symbols (by no means an exclusive instrument of Christian typology) was the most simple and natural ideograph that could be devised to stand as an index of the main basic datum of human life -- the fact that in man the two opposite poles of spirit and matter had crossed in union. The cross is but the badge of our incarnation, the axial crossing of soul and body, consciousness and substance, in one organic unity. An animal nature that walked horizontally to the earth, and a divine nature that walked upright crossed their lines of force and consciousness in the same organism. 414 - 415. The Egyptians in the autumn threw down the Tat cross, and at the solstice or the equinox of spring, erected it again. The two positions made the cross. The Tat is the backbone of Osiris, the sign of eternal stability. And Tattu was the "place of establishing forever." 416. This "raising of the Tat cross" or elevation of the divine spark inside each man or woman was the purpose of our material incarnation, according to the ancient sacred traditions: "This transformation," Kuhn writes, "is made by man here on the cross of material life" (359). Thus, the "pillar of the year" (which is embodied in the Djed column or "backbone of Osiris") is represented in the zodiac metaphor by the vertical "pillar" which runs from the pit of the winter solstice to the summit of the summer (as seen in the diagram above). The Djed column or "backbone of Osiris" was figuratively "cast down" horizontally when Osiris was "laid out" in a sarcophagus like a corpse in the underworld (by the action of the sun's "crossing down" at the fall equinox). But Osiris was not destined to remain horizontal forever -- as the horizontal Osiris image above plainly intimates. He is destined to rise-up vertically, just as the shoots of grain shown rising from his body in the image above are doing. The raising of the mummified Osiris from the horizontal position to the vertical position was associated with the act of "raising the Djed column" from its "cast-down" horizontal position to its vertical orientation. I believe that the raising of the Djed column is figured by the vertical line between the two solstices, shown in the zodiac-wheel diagram above. The raising of the Djed, the raising of the "corpse of Osiris," could be seen to take place when the sun stopped its descending path and turned back upwards: at that point of the very "bottom of the year." The casting down of Osiris and the Djed is symbolized by the horizontal line between the equinoxes (the "casting down point" being located at the point of autumnal or fall equinox, at the end of the sign of Virgo the Virgin), and the raising back up of Osiris and the Djed is symbolized by the vertical line between the solstices, surmounted at the top by the point of Summer Solstice at the very "top of the year" (when the sun reaches its highest point), a point which takes place at the juncture between the signs of Gemini and Cancer the Crab. After Osiris is deceived and then murdered by his brother Set (and Set's seventy-two henchmen) he is sealed in a casket and set adrift in the Nile on the way down to the sea. The "lower half of the year" can be shown to have been metaphorically associated with and symbolized as the sea (and our crossing through this incarnate life, in the material realm that is located in the lower half of the great wheel, is symbolized as the crossing of the great sea such as in the story of Odysseus, or the crossing of the Red Sea in the story of Moses in the Exodus). The murder of Osiris and the usurpation of his kingdom by his brother Set, and the placing of his body into the sea, can also be connected to the inexorable action of precession, "delaying" the rising of Orion (associated with Osiris) on the appointed day over the course of long centuries, until Orion is "held down" beneath the eastern horizon, as if being "drowned" beneath the sea -- and his appointed place is usurped by his brother Set, associated with the sign of Taurus (according to analysis offered by Jane B. Sellers in Death of Gods in Ancient Egypt, following some of the arguments presented in Hamlet's Mill by Giorgio de Santillana and Hertha von Dechend). After he had been sealed up in a sarcophagus and set adrift towards the sea, the the casket containing the body of Osiris eventually lodged in a tamarisk bush and was then concealed when the tamarisk grew into a tree around it, which the King of Byblos then cut down to use as a pillar in his palace, thus connecting the body of Osiris to the World-Tree which is cut down in many myths around the world (including to Yggdrasil, which ultimately cracks apart and falls at Ragnarokk) and thus to the unhinging of the world-axis -- and to the precession of the equinoxes. Although you may see or hear some people describe the image above from the temple of Seti I at Abydos as depicting the "raising of the Djed-column," it actually is not showing the raising of the Djed. In fact, it is showing the "bringing down" of the Djed and the corpse of Osiris, preparatory to his being laid in the tomb (in later scenes). Only later will Osiris be "raised up." This fact is very important, because it is my assertion that the above scene is analogous to the taking down of the body of Christ from the Cross (sometimes called "the Descent from the Cross")! The imagery surrounding the Descent from the Cross supports this connection in absolutely breathtaking fashion. See, for example, this collection of images taken from art through the centuries of this event. Even more striking, however, is the Christian art in the category known as the Pietà and depicting the Virgin Mary holding the body of Christ after the Crucifixion. The "Virgo imagery" in both the above images (of Isis from the temple of Seti I, who died in 1279 BC and of the Virgin Mary from the work of Michelangelo who died in AD 1564) should be quite clear by now to anyone who has read some of the other myth discussions presented on this page, or the Star Myth books or The Undying Stars (previews available here). Through the ministration and power of Isis, Osiris was eventually restored to his vertical position -- the Djed column "raised back up" after being "cast down" into the underworld. This restoration is figured in many existing works of ancient art, some of which are shown below. Readers are probably aware that Osiris was strongly associated with the constellation Orion -- the constellation in the night sky with the highest ratio of bright stars to total stars, and one of the most-recognizable figures in the heavens, making it a fitting representation of the "lord of the underworld," if the heavenly realm is seen as a symbol of the incorporeal realms. The glorious nearby star Sirius, the brightest of all the fixed stars, was associated with Isis. In his nightly motion, Orion can be seen rising in the east and tracing an arc across the sky prior to sinking back down into the west, just as the sun does during the day. During different times of year, of course, Orion rises at a different time due to the progress of the earth in its orbit, which means that at some parts of the year he is already far across the sky by the time the sun goes down, but just considering his motion in general we can see how he embodies the casting down and the raising up of the Djed. When Orion is first rising on the horizon, he appears in a nearly horizontal position, as can be seen in the image above (in which the view is from the perspective of an observer in the northern hemisphere at about latitude 35 north, similar to the latitude of Egypt and the Mediterranean, and looking towards the south, with due south in the center, the eastern horizon to the left, and the western horizon to the right). As he arcs upwards into the heavens he becomes vertical. Then, as he sinks back down towards the western horizon he becomes horizontal again. In the image above, the stars of Orion are shown in all three locations: rising in the east, vertical in the center of the sky at the high point of their arc across the heavens, and then sinking down into the west and becoming horizontal again. The Ankh as a symbol is also closely related to the Djed column, which is also depicted as having a horizontal component (when the Djed is cast down, representing our physical incarnation in "animal" matter) and a vertical component (when the Djed is raised up, representing the uplifting of our spiritual nature and representative of spiritual life). The importance of the ancient symbol of the Ankh simply cannot be overstated. It is a symbol of eternal life, and its close association with two other important ancient symbols, the Scarab and the Djed-column, indicate that this subject of the "casting down" and "raising back up" of Osiris and the Djed is one of tremendous spiritual significance in the sacred myths of ancient Egypt -- and in the myths around the world which can be seen to contain close parallels with the Osiris cycle of myths. Based on the presence of "horizontal" and "vertical" components, the connection between the symbology of the Ankh and the symbology of the Djed is fairly straightforward and easy to understand. But, how are these two symbols connected to the symbol of the Scarab? Let's examine the question more closely -- the answer contains many breathtaking connections and sheds light on the exquisite profundity of the ancient wisdom, bequeathed to us in the mythology and symbology of the human race. image: detail from necklace found in the tomb of Tutankhamun, Wikimedia commons (link). In the image above, an elaborate necklace from the tomb of Tut-Ankh-Amun is depicted, featuring a central figure of a Scarab beetle with uplifted arms, upon what I would interpret as being (based upon evidence presented below) the solar bark. 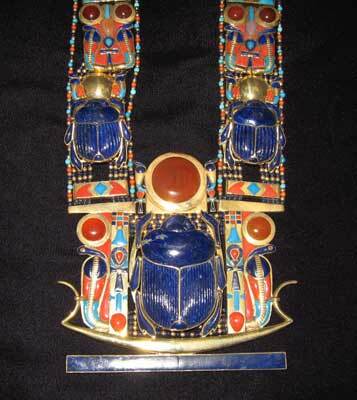 The Scarab is flanked most immediately by two columns which each feature a prominent Ankh symbol (in dark blue) and immediately above each Ankh for good measure is a Djed column (in light blue, with alternating red and blue segments in the "spinal" columns at the top of each Djed). On either side of the Scarab, just outside of the two Ankh-adorned columns, are two uraeusserpents, each with a solar disc above its head, and above the upraised arms of the Scarab itself is another, larger solar disc. On either side of this larger solar disc are yet two more uraeus serpents, and suspended from each is another Ankh. As can be seen from the image above, this elaborate ornament continues on beyond the section in the close-up view shown above: the wide "straps" of the necklace on either side are adorned with another pair of Scarabs, each of which are surmounted by another solar disc (not shown in the image above), this time in gold, and again flanked by two uraeusserpents. Above these Scarabs and solar discs can be found yet another pair of uraeus serpents (on each "strap"), this time flanking a central Ankh symbol (on each "strap"). For an image showing more of the necklace, see for instance this web page, which appears to be an image of a replica of the original (the image above is from the original found in Tut-Ankh-Amun's tomb). I believe that all of these symbols are powerfully depicting variations upon the same theme, which is the raising-up of the immortal, spiritual component in the individual, symbolized by the raising of the Djed column, which is associated with the vertical and immortal portion of the Egyptian cross (the Ankh), and which is also symbolized by the vertical line or "column" between the two solstices of the year on the zodiac wheel of the annual solar cycle. As discussed in this previous post, the vertical pillar of the solstices was connected in mythology with the Djed column raised up, and also with the constellation of Cancer the Crab, the sign which commences at the point of summer solstice (a fact which is commemorated in the name of the Tropic of Cancer, which is the latitudinal circle designating the furthest north that the direct rays of the sun will reach each year, on the day of the northern hemisphere's summer solstice, at the start of the astrological sign of Cancer). Because the constellation of Cancer itself appears to have outstretched or upraised arms, this "top of the solstice column" is mythologically associated and symbolized by the upraised arms of Cancer the Crab -- and, as we have seen, by the upraised arms of Moses in the battle against the Amalekites in Exodus 17, as well as the upraised arms of the Egyptian god Shu. The Ankh symbol (which is closely associated with the symbol of the Djed-column "raised up") itself was often depicted with a pair of human arms raised upwards in just the same way (a famous image from the Papyrus of Ani showing the Ankh with upraised arms, surmounting a Djed column flanked by Isis and Nephthys). And with that in mind, we can now understand the symbology of the Scarab, and why it is "of a piece" with the Ankhs and the Djed columns in this necklace! The understanding that these upraised arms are associated with Cancer the Crab, whose position at the very summit of the year places him at the top of the vertical Djed column that can be envisioned connecting the solstice-points on the zodiac wheel, and whose upraised arms are responsible for the upraised arms that are sometimes depicted on the Ankh-cross, enables us to see that the Scarab itself is another way of recalling Cancer the Crab and the uplifted arms -- symbolic of the vertical, spiritual, eternal force in every man and woman. (Below is an image of the zodiac wheel, with the horizontal and vertical lines depicted: you can see the sign of Cancer with its outstretched arms, looking in this 1618 illustration a bit more like a Lobster than a Crab, at the top of the vertical column and to the "right of the line," just past the point of summer solstice). Here, the upright column can be clearly seen to possess the horizontal bars reminiscent of the vertebrae, and it also is surmounted with the Ankh, or cross of life (incorporating the two parts of the zodiac wheel and the two parts of our human nature, animal and divine). The Ankh also incorporates the circle symbol on top of the cross, which is representative of eternity since a circle has no beginning and no end. It is also representative of the feminine force, joined together with the masculine symbol of the column. And, surmounting it all (of course) we see again the "everlasting arms," uplifted in an expression of blessing, victory, and support. If we consider that the top of the skull forms the very pinnacle of the vertical "Djed-column" in each man or woman, corresponding to the very peak or crown of the year at the summer solstice (representative of Heaven itself as discussed in this previous post, and in its very domed shape most representative of the dome of heaven in the microcosm of the human body, which reflects the macrocosm of the infinite dome of the universe), then it is most appropriate that a Scarab symbol (reminiscent of the sign of Cancer the Crab, which is located at the solstice-summit of the year) is found there on the top of each of our heads! This connection suggests an even more radical and even more transformative ramification for what we have discovered above, because the esoteric and shamanic nature of the world's ancient wisdom-texts and traditions indicates that these teachings are meant to be put into practice by each man and woman who is incarnated in a body: by each man and woman who, these ancient scriptures teach, embodies a divine spark, a divine Thunderbolt, a divine "Christ within." This evidence above suggests that it is part of our purpose here in this incarnation (perhaps even our central purpose) to recognize and to raise that inner spark of divinity, that "vertical portion of the Ankh," that Djed-column which we each share with Osiris, along that central axis that inside the human microcosm reflects the celestial axis of the World-Tree found in the macrocosm. Perhaps this can be done through the practice of Yoga (whose name itself we have seen to be connected to the Ankh and hence to the Djed). Some aspects of this important concept have already been touched upon, in this previous post about the ancient Vedic concept of the Vajra, or Thunderbolt, which we saw in that post to be almost certainly connected to the concept of the raising of the Djed column and the "backbone of Osiris." There, we saw evidence from the work of Alvin Boyd Kuhn that the "N - K" sound of the name of the Ankh is linguistically connected to the name of the practice of Yoga (or yonga, in which the "N - G" sound is linguistically related to the "N - K" of the Ankh). This connection to the practice of Yoga is most revealing, in that Yoga itself is a discipline which concerns the raising of the divine spark up through the chakras of the spine and ultimately up and through the crown chakra, located at a point which is associated with the crown of the head, or the "top of the Scarab" described above! The upsweep of the wide-spreading horns at the top of this "Djed-shaped" god (with the solar disc between them) are strongly reminiscent of the outstretched arms of the Scarab, which we have previously argued is connected to the outstretched arms of the zodiac sign of Cancer the Crab, who is located at the summer solstice point, at the top of the "vertical line" in the zodiac wheel that we are trying to establish as the "vertical Djed column." Again, all of this evidence should strengthen the case that the tree we are erecting as we approach the bottom of the year is a representation of the divine spiritual component in the Cross of the year, the vertical line running from the winter solstice all the way up the summer solstice, the line that represents the lifting up of the "dead god" from his prison in the sarcophagus to the upward line which points up to the very summit of the year at the summer solstice, highest heaven. Figuratively, this raising of the Djed column may well be indicative of our mission in this incarnation: to see beyond the merely physical or horizontal (difficult to do, trapped as we are in these bodies in the same manner that Osiris is bound in his mummy-wrappings), and to call forth the invisible, the spiritual, the vertical. For more on this thought, see the previous post entitled "Blessing and not cursing."